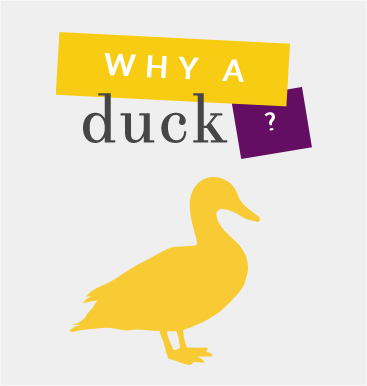 Yellow Duck Marketing provides a variety of integrated marketing services in-house, just like an extension of your marketing department. Without a doubt, the world of marketing has shifted in the past 10 years. No longer will display ads and a basic website be enough to effectively promote your business. From brand strategy to responsive design websites to the latest social media platforms, we’ve adapted to the new age of marketing and can create an integrated plan that works best for you. We may have opened our doors in 2011, but we’re hardly wet behind the ears. Each of the marketing pros on our team has years of experience researching, branding, designing, defining, promoting and positioning products and services. A lot of “-ings,” yes, but we’ve been busy. Let’s talk about our name. Something about the image of a yellow duck makes everyone smile. It’s iconic, which means it’s as familiar and comforting as an old friend, yet it’s also fresh and plucky enough to catch your attention. Our brand does what we believe all effective marketing should do before it calls anyone to action: engage with people’s emotions and make them comfortable. Everyone makes better, more informed decisions when they trust that the people at the table have their backs. And aren’t we all ten times more likely to become loyal consumers and business partners when we’re not being conked over the head with a hard sell? At the heart of good business, you’ll find strong relationships. We want our community to benefit as we succeed. We are active with nonprofits, local associations and churches. You’ll even find us doing countless laps cycling in 24 Hours of Booty to raise money for cancer, marketing their Jeans & Jewels gala fundraiser pro bono or volunteering at Hope Haven. We believe that even little ducklings can make a difference in the world. We might not change the course of human history, but if we do what’s right every chance we get then we can make the world a better place. It’s pretty rare for the right thing to be the easy thing, but it’s what guides our decisions. Life’s too short to not enjoy it. We do marketing because it’s what we love. We work hard but we are no Chinese sweatshop. Creativity happens best when you’re enjoying your work. That’s why we only hire people who know how to laugh and love what they do, and similarly work with clients that love what they do too. You’ve heard the term “water off a duck’s back” right? Well we know how to stay nimble, agile and roll with the punches so we can adjust with our clients' changing priorities. It also means we’re staying on top of industry trends. 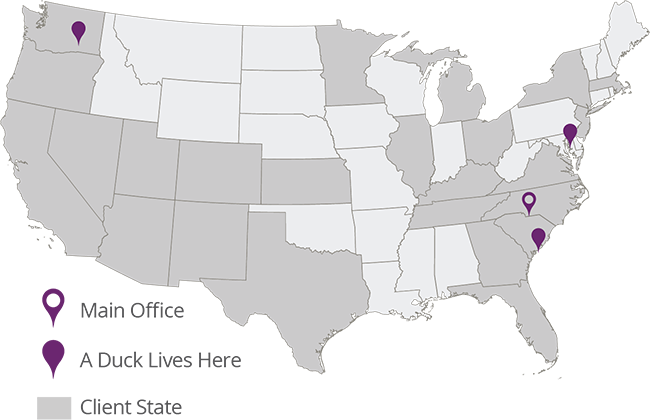 We work with clients from coast to coast - check out the map to see where us ducks have made our mark!